Ed Balls was in town today. I completely understand the anger of former Labour voters who feel betrayed by the Blair and Brown governments he served – to say nothing of the Miliband shadow cabinet. 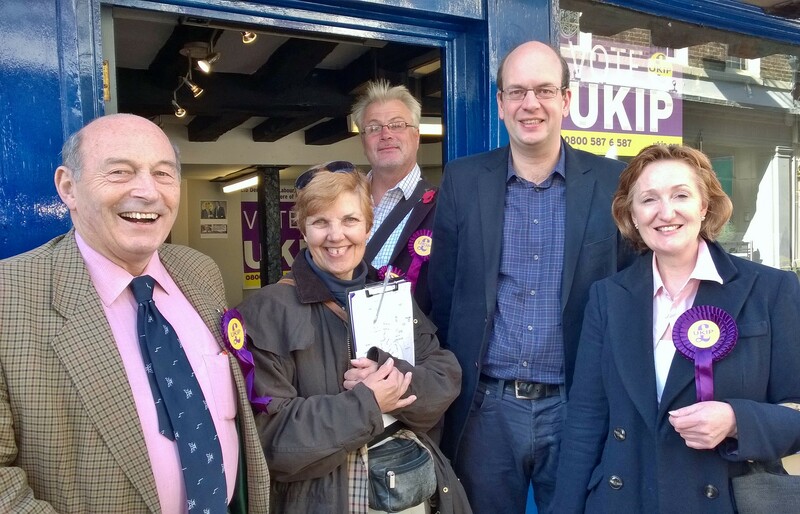 Many are finding the same warm welcome in UKIP I did, where they will never be taken for granted. But I must pull Mr Balls up on one point. He said in Rochester & Strood that I want to let corporations loose on the NHS. I don’t. UKIP’s health policy is clear – defend and fund the NHS. My father was a doctor. My mother was a nurse. My brother is a doctor. I’ve been working closely with the staff at Medway Hospital to get it out of special measures, which is one reason why Strood GP Dr Juneja was good enough to endorse my NHS record. I’m doing the work on the ground. That, not misrepresenting opponents, is how patients get higher standards. Jill Seymour MEP is one of UKIP’s stars on the party’s front bench and it was a real pleasure today to welcome her back to Rochester & Strood for the second time already. The other parties are rounding-up the camera crews for their big names, who get out of a car, offer the old clichés, and disappear back to London again at the very first opportunity. Jill and I tried to do something more useful. 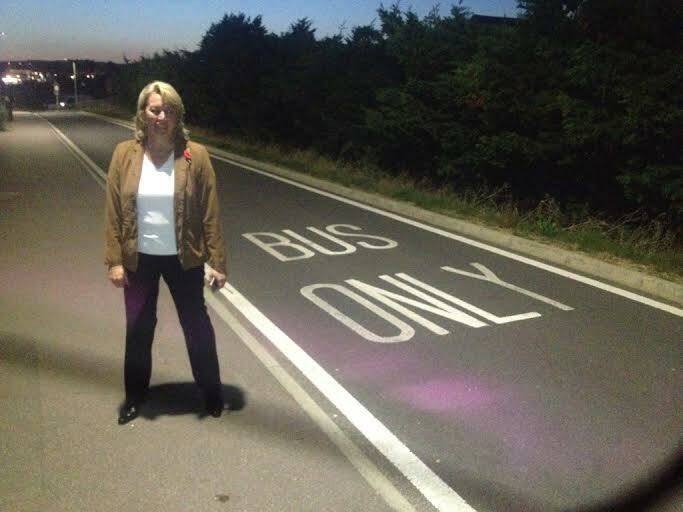 We went to the Tory ghost road at Riverside, Strood built at £13 million expense in a predictably doomed green attempt to stop people driving to work as they wish, and now silent all day save for the odd (mainly empty) bus. What a shambles. The Tory council won’t open it to cars. Conservative-led central government won’t open it. UKIP, when we get the chance, will drop the nonsense and open the road. Jill said it well today – ‘for that much money, I’d have expected a motorway – and a long one’. Not only has she written a book discussing why UKIP really matters – and it’s well worth a look, you’ll find it here, but Suzanne Evans has won a deserved reputation with the People’s Army for leading from the front with real passion, generosity, and tirelessness. She was in Rochester & Strood today to support my campaign, and I really appreciate it. Joining UKIP means finishing up on the same side as people like Suzanne, and I can’t understate how much I’m glad that’s now the case. Some of the dedication UKIP receives is no less inspiring. Caroline Stephens is our prospective parliament candidate for Stroud and I can’t overstate how impressed I am by her commitment to the cause. She’s able to join the local cohorts volunteering because she makes a 300-mile trip each weekend. All I can say is that I salute her and I thank her. She’s not the only one by any means. 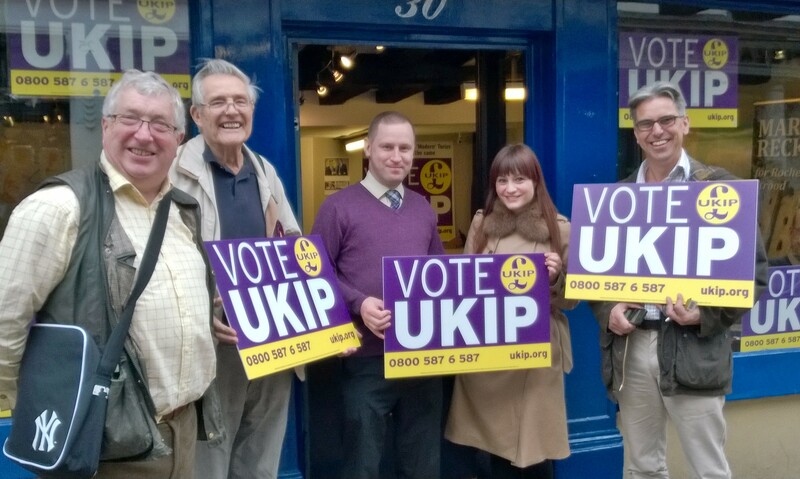 This is the UKIP team from Leicestershire, who got off the bus outside our campaign shop today – a Monday too! – without our even knowing they were making such an effort. They brought their own supply of pork pies too! Dan Hannan, a Conservative MEP of wit and erudition I’m proud to call a friend, put out a good tweet today. It was about the European Arrest Warrant. Actually, that was one of the reasons I’m now in UKIP. This EU arrest warrant makes any British liable to be hauled up in court in any of the other twenty-seven countries trapped in the European project. To put it mildly, they don’t all match the standards of British justice – and British citizens have been caught up in some truly shocking cases. Dan said: ‘There scare-stories about criminals evading justice without the EAW are hysterical. There were extraditions agreements in place before 2004’, the year the EU enlarged so fateful. Dan, you’re right on the money. I’ve long been a believer in democracy not just in the way every decent person is, but in a way I think I can fairly call radical – believing not only in getting power back from Brussels to Britain, but from London to local communities, and in engaging people again in a process that should always have been theirs from the start. This is John Turner. He’s never voted before. He never felt any of the old parties listened to people properly. 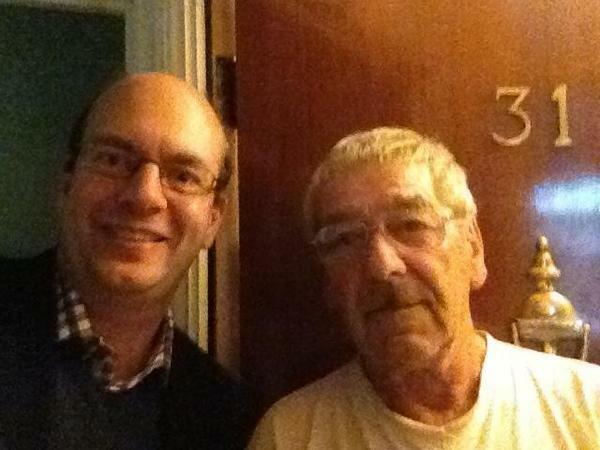 He’s seventy-three years of age and he’s voting for the first time – for UKIP, and for me, it’s quite a humbling thing to be able to say. The count at Clacton this week was a truly remarkable experience. Being there was a deep privilege, not only to witness Douglas Carswell make British political history, but more personally, to see my friend of twenty years returned under UKIP colours. Douglas fought for every vote, neither writing off anyone’s support or ever taking a vote for granted. Alongside his choice to give his constituents the final say over his principled move to UKIP, he proved that this is a party reaching beyond the old tribal lines to win support across the board. 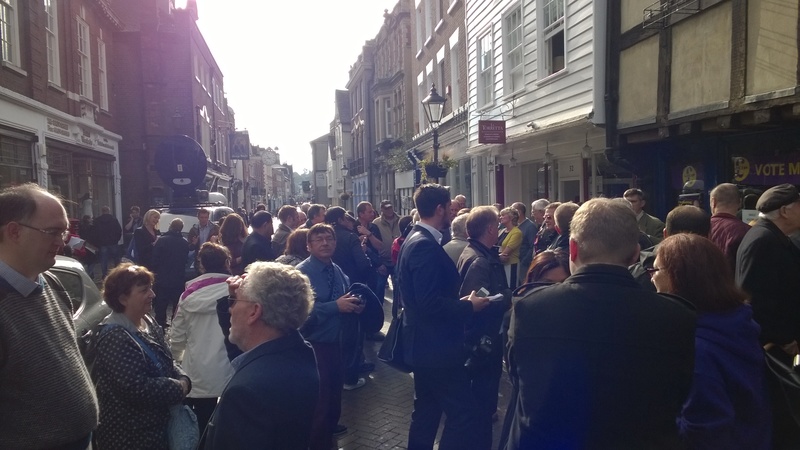 If I had to sum up the mood on Rochester High Street as Douglas joined Nigel Farage and myself for the launch of our local campaign here, I’d have to say ‘infectious enthusiasm’. 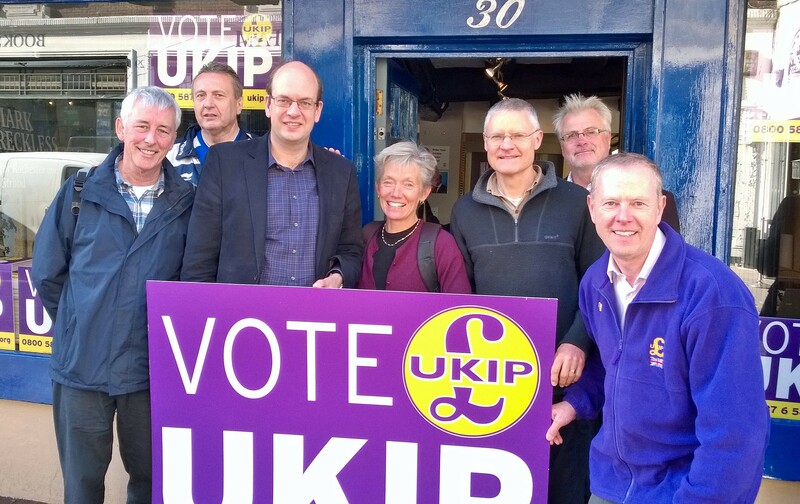 Even before the astonishing UKIP performance in both Clacton and Heywood & Middleton, 75 people were out on the doorsteps of Rochester and Strood on the Saturday the week before, generously giving their time to bring the UKIP message to our constituents. We were too busy setting up the canvass to count how many were in our campaign shop after the speeches yesterday morning, picking up leaflets and posters before heading out for the day, but I’m pretty sure it was at least two hundred and some are saying it might have been as many three hundred. I do know I’m grateful to each and every one – seasoned members of the ‘People’s Army’ and first time campaigners alike! Someone else who is welcome to visit Rochester and Strood any time he wishes is Matthew Parris. I don’t recognise the outrageous condescension he displayed towards Clacton’s voters in many ordinary members of the Conservative party, but he’s an extreme version of the reasons why I knew I had to leave. 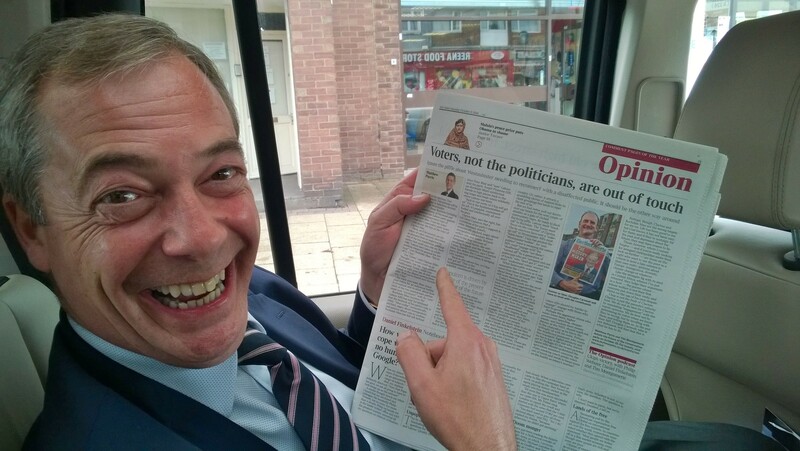 Anyway, his headline on the morning of the launch, ‘Voters, not the politicians, are the ones out of touch’ certainly give Nigel a good chuckle. Politicians can be a bit quick to criticise the media so let me say that I appreciate the fact that journalists are respecting my determination to run a positive campaign on the local issues I’ve been working on since I first ran here as a candidate for predecessor constituency of Medway. A few seem inclined to have me say something rude about the Prime Minister or my former colleagues in the Conservative party, but that’s not who I am or the type of politics voters want and deserve. If you’d like to follow my campaign, I’m keeping my Twitter account fresh with updates during the day. 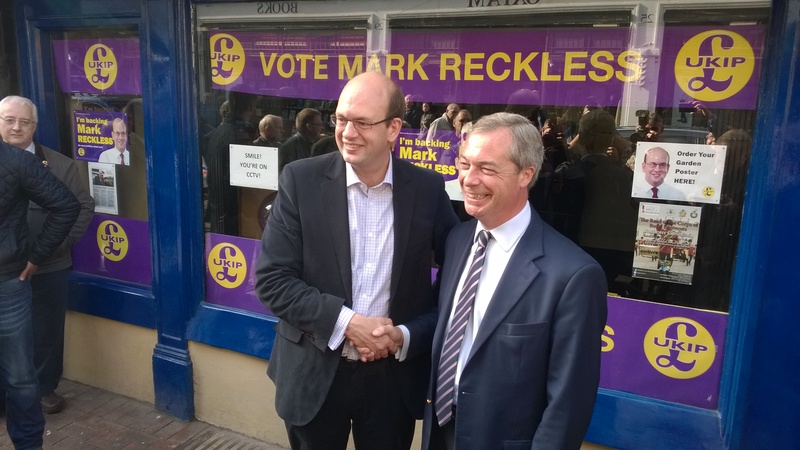 You can find me at @MarkReckless. I’m campaigning hard and if you want to join the effort, I’d be very appreciative of any amount of your time. Feel free to call to the campaign office at number 30 on the High Street in Rochester and either I or one of my volunteers will be glad to welcome you aboard.